I’ve been keeping this one to myself. Largely because there isn’t a huge need for Thermomix activity. But it is so good, as I was reminded by cooking it today, that I need to rave about it for a bit. I discovered the recipe when following the Momofuku opening in Sydney. No, I have not been to the restaurant, but as with many other foodie obsessions (The Fat Duck, elBulli, even the geographically attainable – Movida, Rockpool, Quay) though denied the lived experience of eating at my place of worship, I stalk the food through online recipes, write ups, TV shows and cookbooks. This appealed for many reasons. Pork is a reason alone. The simplicity of preparation, though requiring time, also hugely appealing. Also, the temptation of attempting new things – kimchi and pickled watermelon rind. And as a dinner party meal it can be expanded at the last minute to feed extras, while still being very impressive. Momofuku suggests using a shoulder of pork – skin off. If it comes with skin, cut away, leaving all the fat and use skin to make delicious crackling as a side or as a secret indulgence when you are finally alone again. I love the pork I get at our market butcher – the Stockman’s Choice at Kelvin Grove Markets. You get to bask in wonderful Scottish accents while buying the most flavoursome, succulent pork I have ever had. The cut they have is a porterhouse. Don’t assume I actually know about cuts of meat, but this works very well. Choose a close fitting oven dish for your piece of pork. A lot of liquid eventuates, so high sides is a good idea. A dish that can go from oven to table will also save time and washing up. A little olive oil (or whatever oil you are using for cooking) drizzled on the bottom of the dish. Sit your pork fat side up in its new house and score the fat with a sharp knife in a criss cross fashion. Sprinkle a thin layering of salt over the pork, then get a big bag of brown sugar and pack it on in a layer at least 2cm thick, don’t let any pork peek through. Put a lid or plastic wrap over the top and put in the fridge for 24 hours or until you remember it again. This can be done the morning of your bo ssam dinner, but I find it does work just a little better if the sugar and pork have spent more quality time together overnight. 4 hours before you want to serve up place your pork dish in a slow oven, uncovered. I usually have my oven at 140 degrees for the first 2 and a half hours then put it up to 150 for the last hour and a half. Depends on your oven. I have a slow cook setting on my oven that only cooks things if left in all day. I am not usually that well prepared first thing in the morning, but at least I know I don’t have to buy a slow cooker. You want the sugar nicely caramelising to a dark brown, but not burning and the pork able to melt apart with some soft poking with a fork. To serve use tongs, fork, spoons and tear it apart so there are nice shreds of pork mixing with caramelly sauce. Serve with lettuce leaves to wrap (the actual meaning of bo ssam is apparently wrapped up), rice (where your Thermomix comes in handy), spring onions and ginger in soy sauce, pickled vegetables – watermelon rind recipe coming up, kimchi, grated raw carrot. You could make all kinds of sides to go with this and turn it from a Korean dish to any kind of cuisine you like, just emphasising different flavours. A few spices in with the pork while it cooks will lift it from delicious to sublime (I like a bit of star anise and lime zest). Try not to have too many people for dinner for this one. It is divine on a sandwich the next day. Seriously. Okay, it took me a while to try the Chinese-style stir fry vegetables in the Everyday Cookbook. I didn’t believe it would work. Or it would be a very poor version. A chopped up mushy horrible interpretation of a stir fry. I really only tried it because my lovely area manager told me to. Its part of my job as a Thermomix consultant to try the seemingly impossible and see if it is actually impossible. Because not all the recipes are for everyone. You’ll never guess what happened. Lo, tasty, al dente vegetables in their julienned forms emerged. I have now made it as a side for many meals. The next step was imminent. Fried rice. That combination (as I know it) of left over roast meat, vegetables, rice and your choice of the sauce on hand – soy, fish, oyster. Maybe an egg on top either omelette form or fried, so you can squish the viscous centre through the rice as its own unctuous sauce. I do like to add some tabasco through my cooked rice dishes too. It might be sacrilege but I put it on risotto sometimes too. You don’t have to. Quirky Jo had a fried rice recipe. I have come to trust this woman knows what she is talking about with her recipes. She can cook tasty things. As always, though, I have my own tweaks. My leftover roast meat is a slow cooked pork (no skin, just a nice covering of fat, scored), that was marinated in a little salt and a lot of brown sugar for 24 hours, then cooked slow for 4 or 5 hours until it is soft and you can shred it into a molassesy deliciousness. It is beautiful in its first incarnation served with iceberg lettuce as a wrap, filled with rice, shreds of pork, chopped spring onion mixed with ginger and soy, and some kind of pickle – my favourite being watermelon rind pickle – all a version of a momofuku dish, taken from various blogs on this fantastic combination of flavours, e.g., the bitten word. As the meat in a fried rice it is almost as divine. Paired with some fried bacon its particularly awesome. I try to limit pork consumption to once or twice a month. When I have it I like to make it worthwhile. So, here is what I did. Pour a 400ml can of coconut milk (or cream, as it is what I had in the cupboard) in the bowl. Pour another 500g water in as well. Insert steamer basket and weigh in 400g basmati or jasmine rice. Close the lid, put the MC on and swish the water around for 20 seconds on Speed 7 or 8. You want all the rice wet so it steams through. Heat on Varoma for 20 minutes, Speed 4. As it heats up, chop some veggies to add to the Varoma basket – chopped carrot, broccoli, zucchini, snow peas, bok choy, spring onions, whatever you have on hand and you can convince yourself have some Asian affiliation. Put them in the basket as you chop – harder veg like carrot first – replacing the lid each time so the steam can do its cooking. Quirky Jo steamed some chicken or prawns or bacon underneath the veg at this point. I draw the line at steaming bacon. I want it crispy. And I want my leftover slow cooked pork crispy. So in the fry pan they went, helped with some rendered fat from bacon rinds I like to turn into pre dinner crisps. Crunchy, salty with the sweetness of the melted sugar. Mix with rice and vegetables when each are done. Whisk 4-5 eggs with some garlic chives or parsley (if you happen to have them growing in the garden as I do) or just some salt and pepper. Wet a sheet of baking paper, screw it up and wring out extra water, then line Varoma tray with it, place on top of vegetables and pour in egg mixture. I was supervising bath time at the same time, so the eggs went on a little late. I removed rice and veg and mixed together in the Thermoserver, added some more water to the bowl and put the eggs back on to steam until it sets. 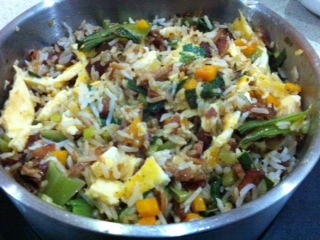 Chop roughly and mix through rice, pork, bacon and vegetables. Serve with or without tabasco. Throw your wok away.